nativevoicesgrandcanyon | "to increase understanding and communication of native perspectives of the Grand Canyon"
Native Voices on the Colorado River (“Native Voices”) offers a cultural education program for Grand Canyon River Outfitters, river guides and the public, to learn about Native American perspectives of the Grand Canyon and Colorado River. 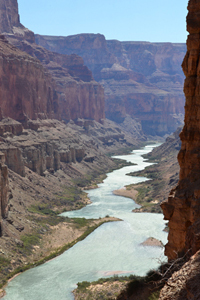 The program represents a unique partnership between the National Park Service (NPS), Grand Canyon River Outfitters Association (GCROA) and the 11 tribes culturally affiliated with the Grand Canyon. Native Voices was developed in 2007 in response to a National Park Service mandate calling for enhanced interpretation about Native American perspectives of the Grand Canyon. Native Voices works directly with tribal representatives from the 11 affiliated tribes of the Grand Canyon, which include; the Havasupai, Hopi, Hualapai, Diné, Kaibab Band of Paiute Indians, Paiute Indian Tribe of Utah (representing the Shivwits Paiute), Las Vegas Paiute, Moapa Band of Paiute Indians, San Juan Southern Paiute, Yavapai-Apache (representing the White Mountain, San Carlos, Yavapai and Tonto nations), and the Pueblo of Zuni. Through cultural workshops, including field trips to tribal lands, tribal members share perspectives, knowledge and histories of their respective tribes as they relate to the canyon and river, but also discuss the contemporary lives and issues that tribes face. Additional information such as articles, reports, maps and photos will also be posted and available on this website. Although the program’s purpose is to educate Grand Canyon river guides and outfitters, the tribes also realize benefits from this interaction. The tribes are learning more about the river running industry, the outfitters who operate within the Grand Canyon and about opportunities for tribal participation in future river trips. Most importantly, the tribes are learning that the non-native river guides and outfitters want to learn the correct cultural knowledge about the respective tribes, so that they can pass on this knowledge to their clients and passengers. Through the efforts of Native Voices, the program seeks to provide respectful educational experiences to those who consider this spiritual and grand place, Home.